Knitting is such a healing activity, isn’t it? No matter how fully I think I know this, I’m still surprised by it. I’m working on this Knitting Pure and Simple Neck Down Shaped Cardigan #241, which is a mouthful of a name, but a very nice thing to knit. I’m in love with the seed stitch on the front edges. I’m in love with the yarn, too. It’s one of those Sundara yarns that doesn’t pool or stripe, except in subtle ways that make the whole thing better. I’m not alternating skeins, I’m just knitting. If it weren’t such a dreary afternoon, the photograph might do it justice. I think I’ll knit along, and ponder my ponderables, and before too long all will be well. And I’ll have a beautiful sweater to show for it, which makes me smile! That is a beautiful piece of knitting – even in dreary afternoon lighting. Keep knitting and pondering all the way to wellville. I find knitting to sooth my frazzled nerves. Something about the repetition and movement just drains the tension right out of me.Now if people would stop doing things to make me feel frazzled in the first place life would be perfect, lol. love the colors – and today was a great day to work on a sweater wasn't it .. don't know if I will be at knitting tomorrow – Himself is doing honor guard tomorrow 2-4 and I'm not sure when he will actually get out because of crowds and we are a one car family right now ..
Beautiful! 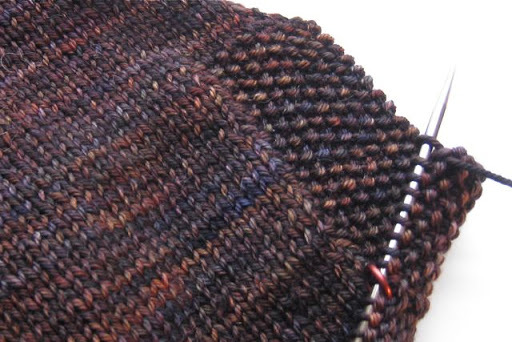 And I agree – sometimes nothing soothes the spirit like a nice bit of seed stitch. I made that cardigan, too, and I love it! Those are such wonderfully basic and lovely patterns, aren't they? am right there with you, pondering my ponderables. love it. and I love the yarn.Something about the slow rhythm of seed stitch that keeps us from racing ahead. 🙂 good for all of us now and then. Whenever I'm stressed, I fall back to my knitting and my problems seem to knit away. Your knitting is beautiful as always. Would love to hear what you're pondering … any chance you'll share your thoughts? Did a big group of us actually sign a pact to all knit that sweater in similar colors? Because Beth and I are also making it to copy Elizabeth's String Theory treat.